dessert « Midlife Crisis Crossover! 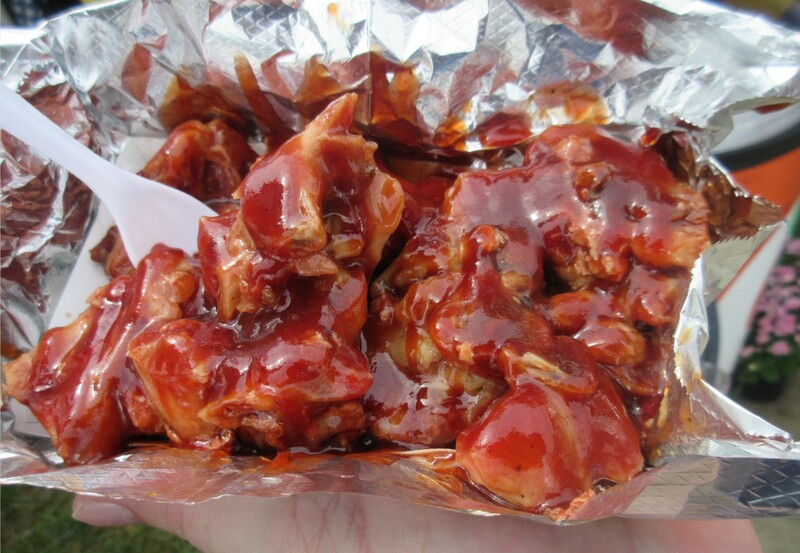 Turkey tips, marinated in a house rub and drowned in an eminently lickable barbecue sauce. It’s that time again! The Indiana State Fair is an annual celebration of Hoosier pride, farming, food, and 4-H, with amusement park rides, cooking demos, concerts by musicians either nearly or formerly popular, and farm animals competing for cash prizes without their knowledge. My wife Anne and I attend each year as a date-day to seek new forms of creativity and imagination within a local context. Usually we’re all about the food. Each year a new lineup of “Taste of the Fair” offerings showcases new ideas from assorted food vendors in hopes of luring in foodies and/or impressing attendees who want to do more every year than simply eating the same tenderloin again and again and again and again and again and again and again and again. Not that there’s anything wrong with that. This year’s edibles expedition had a couple of setbacks, but we made the most of our day anyway. For one, this year’s Indiana State Fair app failed me in the precisely one job I asked of it. The Map function was ostensibly designed with an option to pin the locations of any and all participating “Taste of the Fair” stands. I pressed the correct buttons and received zero (0) results. The option to show all restaurants worked fine but was unhelpful. By and large the State Fair’s vendors go by their boring, adjectiveless company names that describe none of their products and aren’t even featured on their signs. Perfect example: the official Taste of the Fair site lists two new items from a company called Urick Concessions, but hopeful diners could spend days wandering the fairgrounds searching in vain for “URICK CONCESSIONS” banners. Worse still, Urick has more than one booth. We found both items, but at separate booths on opposite ends of the fairgrounds. You’d never know any of this from that failed app. 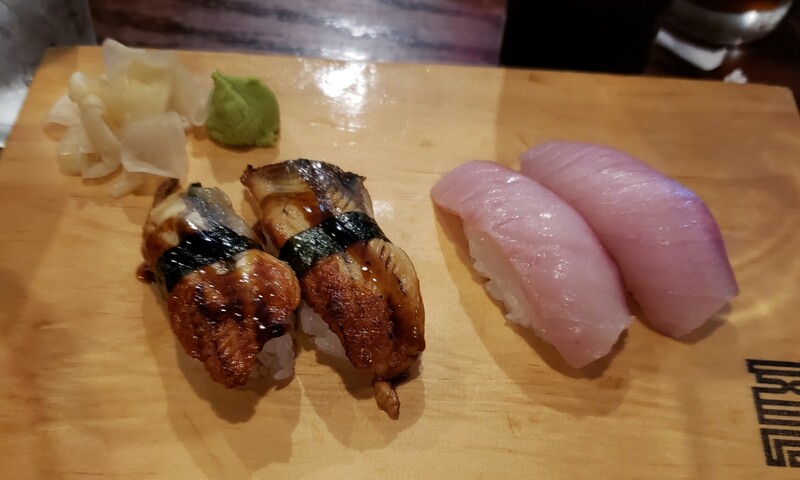 Sushi is about as close as I’ve gotten to an indulgent midlife luxury so far this week. It’s that time again! This week I turned 46 without entering true Midlife Crisis mode yet, and managed not to whine about it or to start browsing prices for sports cars. My frequent sleeping issues, my imperfect hearing, my inadequate eyesight, and my everyday aches and pains all seem at about the same level as last year, which means technically I haven’t lose any ground from a health standpoint, as long as I continue ignoring my receding hairline and avoiding weighing myself. Every glance in the mirror is a reminder of the uncoolness slowly overtaking me and threatening to consume me whole by the time I retire, which is why mirrors should be illegal. For the past several years my wife and I have made a tradition of going somewhere new for each of our birthdays. 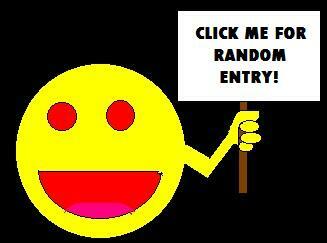 For me last year, it was Motor City Comic Con up in Novi, MI. For Anne last year, it was the Fanboy Expo Totally Awesome Weekend down in Knoxville, TN. Now it’s my turn. That’ll be Saturday, and it won’t be a convention this time, but as a prologue we did dinner with my mom on Thursday night at a great local establishment that no one ever talks about, that my family and coworkers had never heard of, and I don’t understand why not. April 1st: BJ’s Brewhouse presents the Baked Beignet. 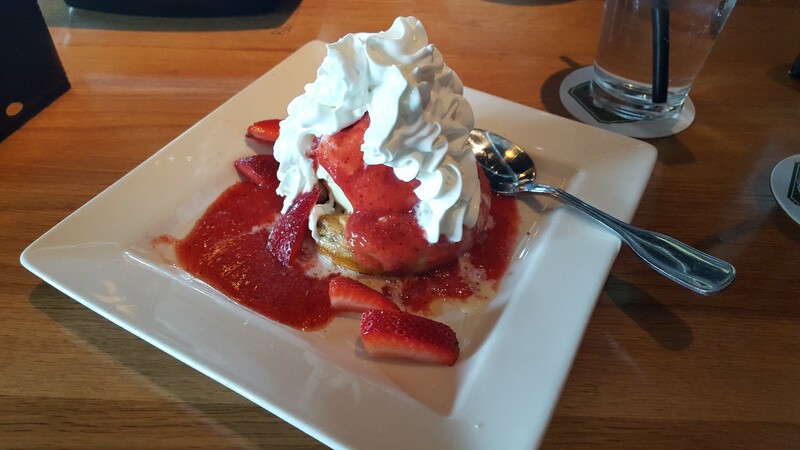 Fried dough tossed in cinnamon and sugar, topped with whipped cream, vanilla bean ice cream, strawberries, and strawberry puree. I had something else planned for this space tonight, but it’s been the kind of week that’s left me wanting to drown some sorrows instead. I could flail about recent stresses on either a personal or national level, potentially spewing a 3000-word tirade that only my wife would read. Or I could take the safer clipfest route and meditate on some of the carefully crafted calories that brightened our days throughout the past year, none of which ever made it into any MCC entries till now. Perhaps “meditate on them” is a bit too lofty. Ogle them. Savor the memories. Wallow in these past comforts. Take some solace that staring at these photos is less unhealthy than having all six dishes in front of me right now and feasting upon them all at once in one sweet smorgasbord. For now, for tonight, this shall do. Today’s haul courtesy of a troop tabling at a local Kroger. It was fun watching three girls race to see who could total up our purchases in their head the fastest. It’s that time again! Every year my wife and I look forward to Girl Scout cookie season, when young-lady empowerment meets the spirit of entrepreneurship and the happy result is another satisfying fix for this perennial craving of ours. Times have gotten harder ever since our usual suppliers went to ground, by which I mean the Girl Scouts we used to know got old and got out of the game. Unfortunately our relatives haven’t been spawning replacement Girl Scouts to hook us up lately, and we’re sadly not hanging out with the right twenty- or thirtysomething crowds whose households harbor these adorable dealers that we can’t live without. That means we have to go prowling around our local groceries and big-box stores in hopes of finding a troop and their moms hanging out by the front door and selling whatever leftovers their own families didn’t buy off them by the crateload. Today we lucked into a batch early in the season, but had to extricate ourselves from a slowly escalating debate over which ones are best. Rather than keep sowing seeds of dissent between those loyal friends, we walked away and left the two moms and a dad to restore order. That conversation haunted me for the rest of the day. When that happens, I usually have no choice but to type out those thoughts, thereby freeing up that obsessing brain space and clearing my head once again. 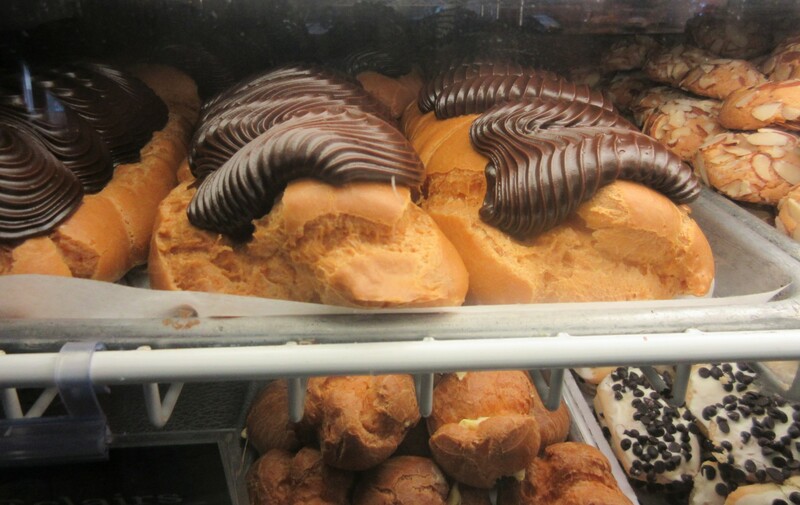 Who needs artisan donuts when you can have bona fide Italian pastry? Throughout our stay in Baltimore, nearly all our paths to and from the Inner Harbor took us through the heart of their very own Little Italy. We’ve walked near Manhattan’s version a few times on our 2011 and 2016 vacations, but were hobbled both times by a third companion who is among the six people nationwide that dislike Italian cuisine. Also, Manhattan’s is only a couple of blocks long and adjacent to Chinatown, so its restaurants are too easy to bypass in favor of the dozens of other nearby options. This time in Baltimore, it was just the two of us — no excuses and almost no barriers. Baltimore’s Little Italy comprises several streets and blocks, encompassing both the African American History Museum and the Flag House to the west, and ending with its southeast corner a convenient block away from our hotel. When we weren’t stopping inside it, we were still walking through it here and there for frequent glimpses at an eminent immigrant neighborhood whose origins date back to the mid-1800s. Superman Celebration 2017 Photos, Part 3 of 4: Festival Food! 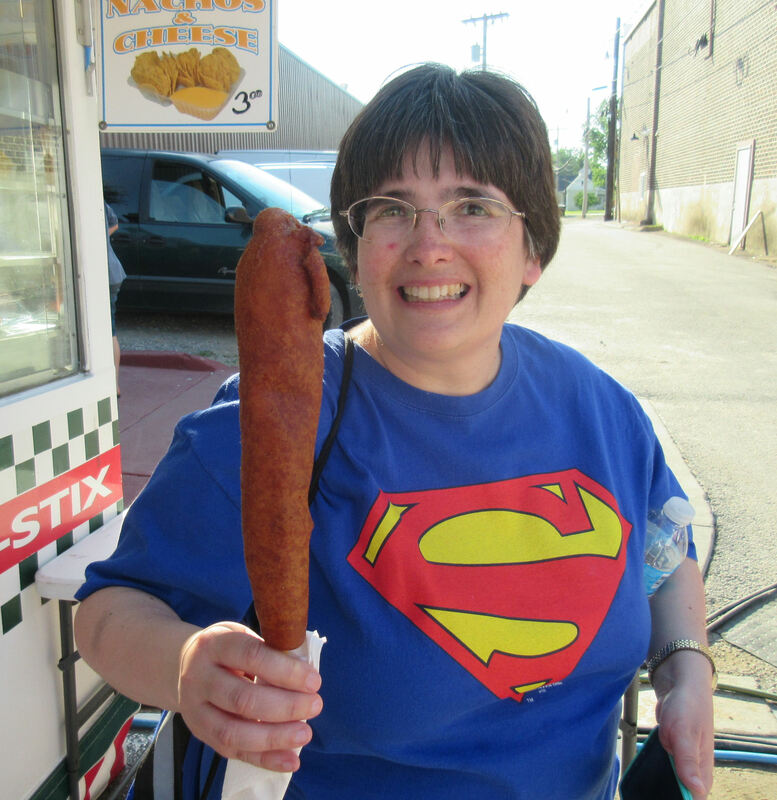 Behold a jumbo corn dog so weighty, you could fend off a Sith Lord with it. We’ve been to Metropolis six times and developed a deep appreciation for one of the most integral aspects of the Celebration: concession stands! Lots of local vendors convene on the scene to bring their culinary A-game, much of it sinfully delectable and almost none of it good for you. Most fans burn off the extra calories walking up and down Market Street all weekend or standing in lines for hours. At the very least they need fuel sources to replenish what they’re sweating off by the gallon in those high summertime temps.